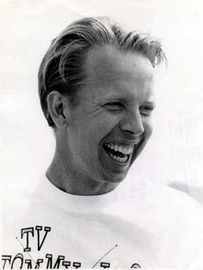 Tommy Ivo (born in Denver, Colorado), also known as "TV Tommy" and "Instant Ivo" is an actor and drag racer, who was active in the 1960s racing community. Ivo's acting career began in the early 1940s, with notable performances including Cousin Arne in I Remember Mama (1948), Denny Dennison in Laramie (1949), and William Button in Plymouth Adventure in 1952. In 1955 Ivo appeared as Shelby in the "Heart of a Cheater" episode of the Lone Ranger TV show. From 1959 to 1961, Ivo appeared as Herbie Bailey on the ABC sitcom, The Donna Reed Show. He guest starred in an episode of the syndicated adventure television series, Rescue 8 and in two episodes of Leave It To Beaver. He also guest starred on the ABC/Warner Brothers western series, Sugarfoot and on the NBC western series The Tall Man. In the 1961-1962 season, Ivo played the role of Haywood Botts in another ABC sitcom, Margie. In 1963 he appeared in the "Honeymoon Hotel" episode of the Petticoat Junction TV show. In 1963, Ivo's Barnstormer (a nitro-burning 392 Hemi-powered slingshot) became one of only two seven-second Top Fuel diggers, so he staged a Seven Second Match Race with the other, the Greer Black Prudhomme car, driven by Don Prudhomme, at San Gabriel Drag Strip. (Prudhomme won.) During 1964, Ivo travelled to England, with Don Garlits, Tony Nancy, Bob Keith, Dante Duce, and other racers to participate in the First International Drag Festival, a six-event series that did much to promote drag racing in the United Kingdom. Ivo was inducted into the Diecast Hall of Fame as an Automotive Legend as part of the Class of 2011.